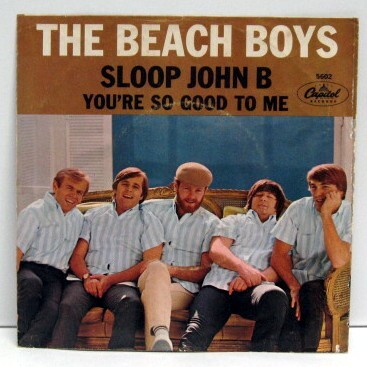 “Sloop John B” was a rare Beach Boys track that was not written by Brian Wilson or any other member of the group. It was an old West Indian folk song, “The John B Sails,” from a 1927 Carl Sandburg collection. Alan Lomax, who recorded many of the leading Delta Blues artists, made a field recording of it during 1927. The Weavers and The Kingston Trio turned it into a folk song during the fifties. It was Al Jardine who suggested to Brian Wilson that The Beach Boys record it. Wilson changed the tune around and made it into a rock classic. It appeared on the groups legendary PET SOUNDS album. It was released as a single during the early part of 1966 and reached number three on the American singles charts. ROLLING STONE MAGAZINE ranked it as one of the 500 greatest songs of all time. It would be a Beach Boys concert staple for decades. Today it is over shadowed by many of their classic songs but remains a wonderful part of their vast catalogue. The Rolling Stones had already had two number one hits during 1965. Both “Satisfaction” and “Get Off Of My Cloud” had topped the American charts. Near the end of the year they released the ballad “As Tears Go By” which reached number six. 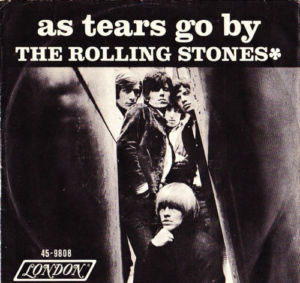 I have always preferred The Rolling Stones in rock mode so “As Tears Go By” is not one of my favorites. Good lyrics but the music leaves me a little cool. It did come with one of my favorite Stones picture sleeves however. It is alot slicker and artsy than the ones that preceeded it. It showed the group was becoming a little more business savy as the rocketed toward the top of the rock universe. 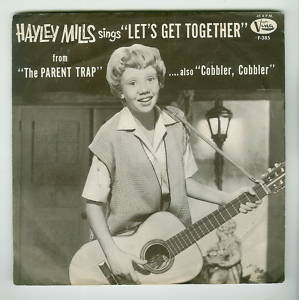 “Let’s Get Together” was child actress Hayley Mills only top ten single which was quite a feat as she was not really a singer. The picture sleeve shows her playing or holding a guitar and I don’t think she was a guitar player either. What she was and is, is a very talented actress. At the time she was on the verge of become a poster girl for millions of young boys due to a series of movies with the Walt Disney Studio. “Let’s Get Together” was taken from the movie “The Paren Trap” in which she played twins. It would reach number eight on the American singles chart in September of 1961. In the final analysis it did not matter if the vocal was weak as people bought the record because of her star power. The Doors released their first single, “Break On Through,” and it only reached number 101 on the American singles charts. If you don’t succeed, try try again. 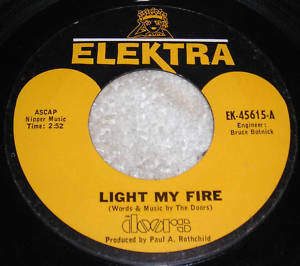 “Light My Fire” was the second single and it would top the American charts for three weeks during September of 1967. It is now recognized as one of the classic songs of its era. The single was a shortened version of the album track. Jim Morrison’s vocal, and Ray Manzarek’s organ would propel the song and their debut album to massive sales and become the group’s first step toward The Rock And Roll Hall Of Fame in 1993. While most songs by the Doors would have writing credits attributed to the group, it would be Robbie Krieger who was mainly responsible for this song. If it had been the only song he ever wrote, his career still would have been memorable. Today “Light My Fire” remains a radio staple and one of the cornerstones of rock ‘n’ roll. An American Prayer by The Doors is definitely an acquired taste and for many it is a taste that is difficult to swallow. Whatever one’s feelings about the album, it does remain an interesting look into the mind and poetry of Jim Morrison. I must admit it is an album I have not listened to for decades. If I want some Doors on my turntable, I usually turn to L.A. Woman, Morrison Hotel, or their debut. Whatever my feelings, though, American Prayer was a commercial success at the time of its release. It may have only reached number 54 on the American album charts but it did sell a million copies and receive a platinum sales award. This was a posthumous album. Robbie Krieger, Ray Manzarek, and John Densmore reunited seven years after Jim Morrison’s death and recorded backing music to set to some of his poetry. While recognized as an official Doors studio album, it is very different from all of the band’s other releases. The poetry is typical of Morrison. He had a way with words and was able to create images that would mesmerize. These words and images were not always clear or understandable but they have a weird depth about them. The music tends to fit the words well. While the band revisited some psychedelic sounds from their past, they were smart enough to fit the music to the individual poems. Rock, classical, and even some smooth-jazz tones provide a nice background and add a positive effect to Morrison’s spoken words. The only oddity is a seven-minute live version of “Roadhouse Blues.” While it does not fit in with the rest of the material, it is so good that it makes you wish for more of the same. It may have been included because of the record company’s desire for a single from the album. An American Prayer is probably just for committed fans of The Doors. The 1995 remastered release is divided into sections and is a good deal longer. In the final analysis it occupies an interesting if nonessential place in The Doors’ catalog. Absolutely Live was released during July of 1970 when The Doors were at the height of their creative and commercial power. The album remained the definitive document of their concert style for years. It was not until the CD era opened the flood gates of unreleased material that this album was superseded by better releases. My only real complaint with this album is the method in which the songs were assembled or, I should say, put together. I have always preferred to hear a concert in its entirety, the good with the bad, as it presents an accurate picture of the artist live. Such is not the case here. Not only do the performances come from many different shows, but the actual songs are pieced together. Separate parts of the same song were originally spliced together in the hope of creating the perfect track. Legend has it that hundreds of song bits were used to create this double album. It all adds up to The Doors live but without a true concert feel. The band’s choice of material was consistently excellent and interesting; it was not just a regurgitation of their greatest hits at the time. A number of rarely performed tracks made the album, which made it unique in The Doors’ catalog at the time. They also included complete versions of two of their lengthy pieces. Among their well known songs to be included were “Break On Through (To The Other Side) #2″ — featuring some creative guitar work by Robbie Krieger — as well as“Five To One,” which is always welcome no matter what the format. This early live version of the latter finds The Doors at their best. A seven minute “Soul Kitchen” then brings the album to a nice conclusion. The two long tracks probably sum up the live Doors best. “When The Music’s Over,” at sixteen minutes, and “Celebration Of The Lizard,” at fourteen-plus minutes reveal Morrison, Robbie Krieger, John Densmore, and Ray Manzarek at their most powerful. Morrison’s charisma, stage performance, and lyrics move front and center while the group expands the material into unexplored territory. Today there are a number of other live performances by The Doors that are equal too or superior too Absolutely Live. Still it remains a nice look at the career of one of rock’s classic bands circa 1970. From The Sundance, Berlin, Deauville, and San Sebastian Film Festivals to your living rooms;When You’re Strange: A Film About The Doors. I have always found any film or project concerning The Doors both interesting and problematic at the same time. The Doors and Jim Morrison remain shrouded in myths and legends almost forty years after their demise. Whenever someone pries into those mysteries it always ends up a little disappointing. Maybe its best to just let The Doors be and worship them from afar. The latest entry into The Doors documentary sweepstakes was written and directed by Tom DiCillo with narration by Johnny Depp. This is a production of love for DiCillo. He considers their story the most compelling in American rock music. Sometimes, however, love does not allow a person to think and see clearly and so there are both positive and negative aspects to this film. First the good news! The footage which is used is for the most part crystal clear and in many instances appears pristine. Whoever cleaned some of this archival material should be commended as it looks like it was shot recently. The story also makes sense and flows well while Depp’s narration is smooth and enhances its effect. There is a lot of excellent and rare footage. The performance of “Light My Fire” on The Ed Sullivan Show, the Miami concert riot, the too short creation of “Wild Child” in the studio, and more help to create and make the story interesting. Bonus features include interviews with Admiral George Stephen Morrison and sister Anne Robin Morrison-Chewning. His father died during 2008 and this interview is all to short. He does not come across as the over bearing parent that history has portrayed him but rather appears caring and proud. Now the not so good! The film could have made use of any number of interviews. There are still many people alive who could have added greatly to the story. There was also too much emphasis upon Morrison’s addiction problems. While part of the story, these problems are well known. There is also not enough accountability for the group’s problems. Manzarek, Krieger, and Desmore were just as responsible as Morrison and these issues should have been explored. Sort of in the middle were clips from Morrison’s film Hwy – An American Pastoral. While they were used judiciously, it left me wanting to see the entire film. When You’re Strange: A Film About The Doors,while by no means exhaustive, is interesting in many places. It is a treat for the eye and examines their career from some odd angles. However at the end I find myself wanting more. You are currently browsing the Muskmellon's Blog blog archives for July, 2010.